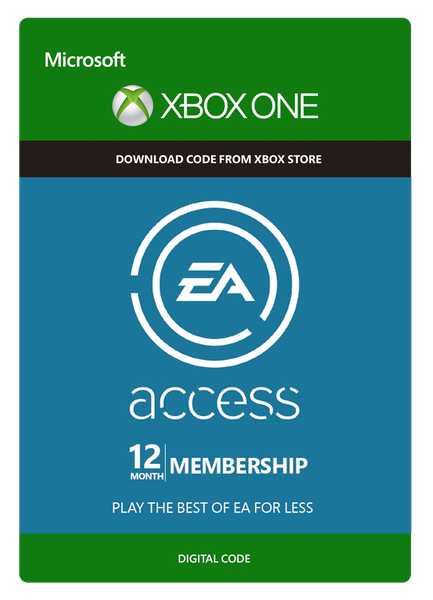 Buy EA Access 12 month subscription for Xbox LIVE on GGlitch.com | Fast, secure and easy! Play more with EA Access Get dozens of great games ! Member benefits of EA Access Play an ever-growing collection of EA games from franchises like Battlefield, FIFA, Dragon Age and more as much as you want. Play more with EA Access Get dozens of great games ! Member benefits of EA Access Play an ever-growing collection of EA games from franchises like Battlefield, FIFA, Dragon Age and more as much as you want. Plus, try new EA games days before release, and save 10% on EA digital purchases on Xbox One (full games, DLC and more). An instant library of Xbox One games Play as much as you want in The Vault – your growing collection of EA’s best games. Why EA Access? Play EA titles before launch on Xbox One Be the first to download and explore new titles as a part of your EA Access membership. Since you're playing the real game and not a demo version, your stats and save progress automatically carry over if you buy once the game is publicly available. 10% off EA digital purchases Expand your collection without breaking the bank by visiting the Xbox One Games Store and checking out your exclusive EA Access discounts. Digital pre-orders, full game downloads, Season Passes and DLC all come with a 10% price reduction.